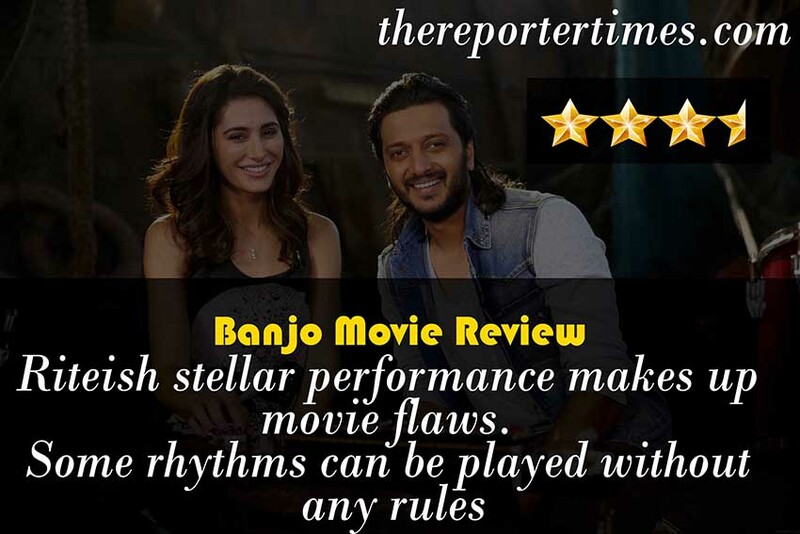 Banjo review and rating: Riteish stellar performance makes up movie flaws. Some rhythms can be played without any rules, Banjo is moreover an outlander making its way to amuse silver screens. Getting the film leaked right at the time when you are not financially strong can be the worse thing happened to any bollywood star. Because of some mistakes, censor board copy of Riteish Deshmukh’s last film ‘Great Grand Masti’ was leaked few days ago. It’s most probably happening for the first time that Riteish can be seen in a leading role after marathi film ‘Lai Bhaari’. The movie couldn’t performed better and amounts big losses for everyone. But after a small short break, Ritesh is back again with a new film on silver screen. On a serious note, no comedy this time. Although his character does plenty of common jokes but no focus on comedy in any case. It has been a long time, he hadn’t done any film being the solo actor in leading role. The movie is directed by his close associate Ravi Jadhav and quite good direction has been observed in plenty of scenes. This is the third film by Nargis Fakhri consecutively this year after Azhar, Housefull 3 and special appearance in Dishoom. Fact couldn’t be ignored that American actress had fetched plenty good name in the industry. Even having so many films, her Hindi is not well which could be observed as an hussle behind launching herself in full swing. Nargis Fakhri aka Kris is playing a role of musician based in New York City. She is quite desperate in exploring the world around her and observing the things. After listening to a song from Mumbai’s local ‘banjo’ band she got eager to meet them. The recording was sent by her friend Mikey aka Luke Kenny. She flies all the way from NYC in search of the band and her search ends at local slums of Dharavi. 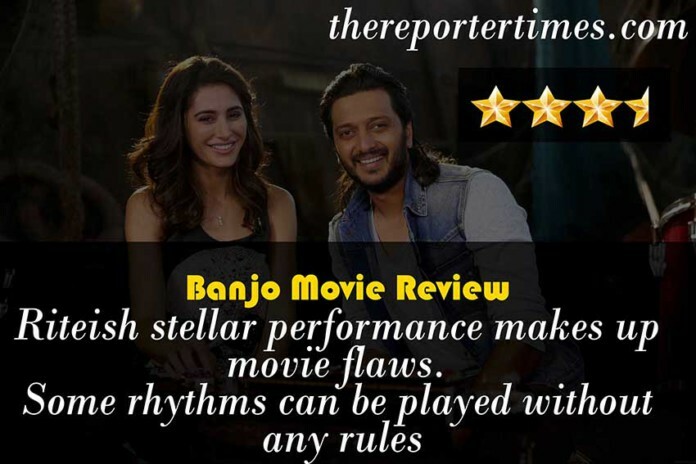 Banjo Review [Short] : Riteish stellar performance makes up movie flaws. Some rhythms can be played without any rules, Banjo is moreover an outlander making its way to amuse silver screens. The entry of Riteish Deshmukh and his encounter with Nargis Fakhri was a miss. The mood swings was too fast that we can’t even figure out whether this is a film or reality series. The same has been managed by Ritesh definite acting in series role. He managed to control the things even in the most adverse situations. Banjo was not expected to be an easy journey having a lot of hiccups. Although many of us find ourselves in a difficult position while relating pain, agony and the anguish through which the protagonist traverses. The eccentricities in Nargis character needs to finished upon in the first half itself, not portraying the character of a lead star correctly could be a crime in bollywood. Nargis Fakhri is adorable in the movie, this time the good part of the story is, she is playing role of a NYC born which had possibly saved her role. Hindi accent always was a problem in her career but not this time. The main point we discovered while watching the film is, The screenplay and direction are non-linear. Quick mood swings and displaying a lot of content in 2 hours watch could be a difficult job which was greatly performed by Ravi Jadhav. Coming to the cinematography, hot looks of Nargis Fakhri are a negative and unnecessarily dragged in the story. This comes to be a very adverse point, it appears director just wants to show the actress in alluring dresses just to attract a part of audience, this had damaged a good film. Vishal-Shekhar work with the music is highly appreciable. They had just provided the best suiting music at every stage. The picturization and composition of the Ganpati songs can be related to various movies released a few years back. Coming to the group performances by camaraderie, they are just out of the world. Perfect chemistry can be observed. When the number of actors are high, its important to divide the attention regularly, which had been done here perfectly. Movie is filled with excellent performances, Taraat is perfect lover and perfect idiotic. The plot of the film is very much predictable and can be easily guessed during the first half or trailer itself. A film with good plot is a scarcity in bollywood which hasn’t been seen after Amitabh Bachchan’s Wazir. Ravi Jadhav needs to understand his responsibility while releasing the film. Its actually equally important to maintain a kind of excitement before coming to the conclusion. The story is as same as good vs bad story. The evil tries to keep the band in limit but fighting the atrocities, band raises and strikes back with more power. Shouldn’t we expect more? Obviously yes, this is the time industry is going to be lead by directors like Ravi and actors like Nargis and Ritesh, so the expectations would be high. Coming to the conclusion of Banjo Review, We could say this film is perfect one time watch. Its still way better than all the recent releases of any of the star. At some times, Director should allow audience to use their brains but that ain’t happen. When Nargis started her career with ‘Rockstar’ she received a good amount of criticism but in this film, she took the power and turned her weakness into power. We are giving Banjo rating of 7/10 stars. Do share Banjo Review with your friends. Previous articleUdaan 23rd Sep 2016 Friday Full episode: Will Suraj kill Chakor for betray ?